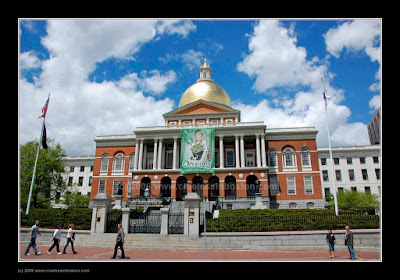 The Boston Celtics are in the NBA Playoffs and the state house has hung a large banner off its front portico in their honor. The state house has done the same thing for other local sports teams. I'm not much of a basketball fan, so this picture is for my oldest son who is a big fan. Wow, with that golden dome, blue sky and those puffy clouds, I thought for a minute we were in Paris! Beautiful shot on a beautiful day. I haven't kept up with the Celtics since the days of Larry Bird. . .
PS- We are all wishing your esteemed senator well as he faces his recently diagnosed health problem. -K.
I'm not much of a sports fan, either, but I sure like the sky above the State House. My oldest son is also a very big Basketball fan!!! I find this spring we have had a lot of magnificent skies...or may be it's just that I notice them more now!! Love the photo! I'm not much of a basketball fan either, but I have been watching the Celtics games during the playoffs.